The all new and improved Taste of the Wild Pacific Stream canine formula with salmon, whitefish and beef in gravy is a grain-free formula suitable for all dog life stages. A great-tasting complement to the Pacific Stream Canine dry formula, or a stand-alone diet. Made with salmon this formula offers a taste sensation like no other. 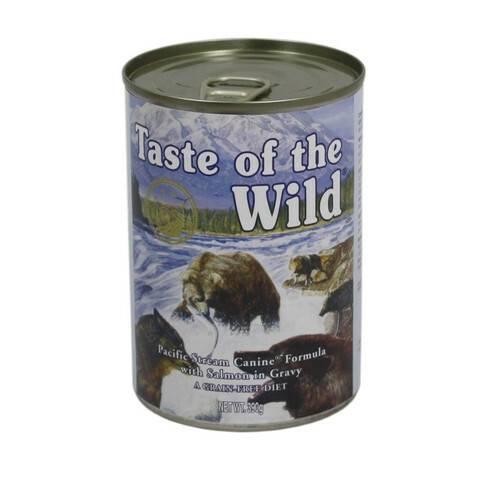 Contains salmon, whitefish and beef for a blend of fowl that provides optimal amino acid nutrition. Supplemented with vegetables and fruits, this formula delivers antioxidants to help give your friend a healthy lifestyle. Available from Kennelgate Pet Superstores, also available in the Sierra Mountain, Southwest Canyon and Wetlands Formula. Salmon 16%, whitefish 15%, beef 8%, peas, potatoes, minerals, sunflower oil, flaxseed oil, inulin, dried tomatoes, dried sweet potatoes, dried blueberries, dried raspberries. Vitamin A 3,000 IU/kg, vitamin D3 420 IU/kg, vitamin E 40 mg/kg, vitamin B complex 26.3 mg/kg, zinc sulphate monohydrate 107.14 mg/kg, manganese sulphate 11.72 mg/kg, sodium selenite 0.82 mg/kg, calcium iodate 0.6 mg/kg. Crude Protein 8%, Crude Fat 4.5%, Crude Fibre 0.5%, Inorganic Matter 2.5%, Moisture 81.0%.